Where Does Resistance to Change Exist Within the System? There are many reasons change is needed in the garment industry, and yet progress has been painfully slow to achieve. What are the forces of “dynamic conservatism” at play in this system? This section will examine the various points of resistance to change that exist, and explain how they serve as powerful linchpins for the status quo. The garment industry, though unique in many ways, closely aligns itself to the principles of consumer capitalism and exponential growth that have dominated global economic and political discourse for the past five decades. It has been touted as the best mechanism by which to increase prosperity for all, with Gross Domestic Product (GDP) used as a standard tool to measure well-being and signs of slowing economic growth portrayed by both politicians and the media as something to fear (Lewis, 2013, Chapter 7, Section 4, Para. 5). During this time the global economy has expanded nearly five times its size (Jackson, 2009, p. 487), and at present rates is expected to be eighty times larger by the year 2100 (Lewis, 2013, Chapter 3, Section 2, Para. 18). This growth has resulted in a doubling of overall material flow through the industrial system every twenty years (Fletcher & Grose, 2012, p. 54). The implications of relying upon such an economic system on a finite planet are not difficult to imagine, and in fact, have already begun to be quantified: in the past 50 years, for example, we have already seen the degradation of an estimated 60% of the planet’s ecosystems (Jackson, 2009, p. 487). This growth has also failed to deliver on its promise of prosperity for all, with one fifth of the world’s population earning just two percent of global income (Jackson, 2009, p. 6). Potential Leverage Point for Change: Many organizations and people such as the New Economics Foundation, Prof. Justin Lewis, and sociologist Juliet Schor have argued that instead of perpetual and exponential growth, employee productivity gains could be exchanged for extra leisure time, not money. In this way, reduced working hours could contribute to increasing societal well-being instead of threatening livelihoods. The 'dilemma of growth' caused by an economic system that relies upon exponential levels of growth to maintain its stability (see diagram, above) has thus resulted in a situation where the continual expansion of resource consumption to fuel growth is unsustainable, but de-growth under present conditions is unstable (Jackson, 2009, p.65). Why then, is an economic model that has clearly outlived its fit for purpose still revered as the only way forward? The rising influence of large and profitable corporate entities in the last few decades is one obvious explanation, as is the influence of globalization, which slyly resists the reach of national regulation (Princen et al., 2002, p.146). The garment industry has been far from immune to these forces and drivers; indeed, they help to explain much of what has occurred over the past few decades. Though not all fashion companies are multinational conglomerates, the leverage and influence exerted by the largest brands on both the industry and the spirit of competition is significant - Robert Ross, director of international studies at Clark University estimates that eight to ten of the largest clothing chains account for as much as 70% of clothing bought at wholesale (Harney, 2008, p. 40). Disconcertingly, as priorities shift more and more toward the pursuit of profit maximization, the chances of tackling environmental and ethical issues diminish. Industry leaders are often chastised for their inaction when it comes to dealing with the very serious impacts caused by the garment industry. This section will explore some of the structural reasons why it appears to be so difficult to effect change. One possible explanation for the resistance to change exhibited by companies who have adopted fast fashion principles is that the core of their business model is often based upon intimately connected, yet fundamentally unsustainable practices used for profit generation (Black [Ed. ], 2013, p. 209). 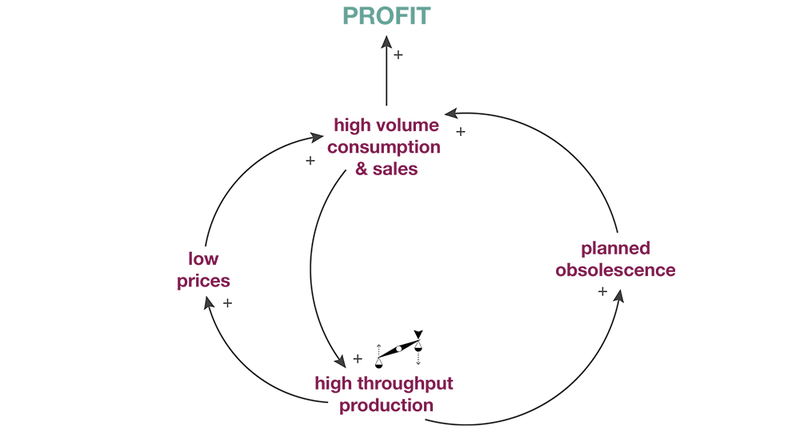 These principles can be generalized into four main areas: low price, planned obsolescence, high-throughput production and high-volume consumption (See diagram, below). Potential Leverage Point for Change: High throughput production techniques might be re-imagined as loops instead of linear chains to allow for fashion renewal while reducing material throughput. By offering low clothing prices, brands capitalize on the “substitution effect” - that is, the tendency for people to buy more of a product when its price is lower (Schor, 2009. p. 88). Along with low prices, the model also relies upon planned obsolescence and the quick turnover of styles to encourage customers to frequently return to the store to purchase more. If any one element of the model is significantly altered, however, its effectiveness as a whole would be impacted. For example, were fashion cycles slowed in the existing mode, clothing consumption would fall. Since the business model relies solely on the sale of new clothing and accessories for revenue generation, profits would decrease as well. Similarly, calls to pay garment workers a living wage and provide safe working conditions would necessitate increases in the cost of production, and likely result in decreased sales since the model currently relies on low prices to fuel customer spending. In short, low prices are essential to maintaining the levels of consumption fast fashion businesses rely upon for financial success. Business models based on principles of speed, quantity and low prices have translated into significant profits for the companies that adopt them. Leaders of this type of retail model typically achieve 16% profit margins – 9% higher than the “typical specialty-apparel retailer” (Sull & Turconi, 2008, p. 5). They’ve also been able to withstand challenging economic conditions, with some companies dramatically expanding their sales during the most recent 2008 global recession (Sull & Turconi, 2008, p. 5). It is no wonder, then, that the industry as a whole has begun to adopt similar strategies, and that those who have benefitted from such a model are resistant to change. Placing focus solely on speed and quarterly profits tends to encourage a myopic and short-term mindset for decision-makers, however, who pursue growth in a highly competitive environment and are distanced (sometimes profoundly) from the impacts of their choices. Currently in highly competitive environments like the garment industry, finding competitive advantage is essential to remaining in business. One way of gaining a financial edge is by externalizing costs in the countries where companies source the manufacturing of the clothing they sell. For this reason, Princen, et al., have dubbed developing countries with lenient environmental and labour regulations and eager governments looking for Western investment a form of “frontier economy” - that is, a place in which costs may be exported across jurisdictional boundaries (Princen et al., 2002, p. 106). Since the vast majority of companies do operate within the lenient laws set by developing nations (be they minimum wages, water contamination policies, etc. ), at present there is little incentive for businesses to stop taking advantage of cost externalizations. Divestment from manufacturing has also made it easy for companies to simply pass blame to contractors for any infractions that do come to light. This, combined with the ease of moving from country to country in search of the lowest production costs impedes any effort to “level the playing field” among competitors - the only context in which restraint makes competitive sense (Princen et al., 2002, p. 124). Over time, corporate brands as a whole have systematically gained control of symbolic resources - the symbolic meanings found in and represented by consumer goods. Many, including those within fast fashion companies, are unhappy with the negative human and environmental impacts caused by the garment industry, but given current global conditions and their power within the system, industry leaders have little incentive to alter the fundamental nature of their business models. This suggests change could be dependent upon alterations to external conditions (like an increase in resource costs or a change in customer values and demands), or the re-balancing of power into the hands of a more diverse body of players where checks and balances are more likely to occur. Many socially and environmentally conscious entrepreneurs are eager to move the system toward a more hopeful future, but even they may exhibit some resistance to change. Designers, for example, are often so entrenched in ‘the way things are done’ in the fashion industry that they can sometimes find it difficult to step into new roles where design is re-imagined as a more participatory process (Niinimäki [Ed. ], 2013, p. 191; Black [Ed. ], 2013, p. 142). Handing over the metaphorical reigns of design, especially for those with many years of formal training and experience, could undoubtedly be quite threatening. Many designers are also incentivized and rewarded by the industry for perpetuating consumerism, with industry prizes, employee bonuses and even press acclaim almost always based on how many units of product are sold. In this way, design’s deep entwinement with consumption can limit the scope of possibilities considered by designers and entrepreneurs. This, coupled with the immense power differential faced by small unconventional voices in an industry dominated by fewer and fewer powerful brands, can impede change for smaller players, be they designers, business owners, entrepreneurs, or the like. Ideas of morality often weigh heavily on discussions of consumption and consumerism (Henry David Thoreau comes to mind), but the symbolic role material possessions play in our lives should not be downplayed. Jackson warns against simplistic prescriptions for change that fail to recognize the symbolic importance of material things, noting, “their embeddedness in social conversation, their vital role in negotiating meaning, and the depth of their engagement in cultural myths and narratives suggest that material consumption patterns might represent a sphere of resistance - potentially quite violent resistance - to social change” (Jackson, 2006, p. 388). It is common for pundits to demonize fashion as frivolous and unnecessary, but these forms of criticism ignore the deep cultural meaning that can be embedded in the art of dressing and the significant role clothing can play in our lives. Part armour, part window, fashion and clothing can hint at materialized stories of our inner worlds. It is no wonder, then, that we hold it so dear. In contrast to the more positive benefits clothing can provide its wearers, fashion commerce has also produced social anxiety and fear; of judgement, loss of status, and exclusion. (von Busch, et al., 2014, p. 53). The commercially-driven pressure to be attractive and follow societally approved regimes of beauty has thus bound the act of dressing to associations of power and control in complex ways, especially for women (Entwistle, 2000, p. 23). This pressure to maintain one’s social status undoubtedly contributes to the cognitive dissonance that can be seen between individuals’ values and their purchasing behaviours: disconcertingly, as the public understanding of sustainable clothing: a report to the Department for Environment, Food and Rural Afairs (DEFRA - UK) reveals, “Even amongst the most pro-environmental, clothing choices most often derive from considerations of identity and economy rather than of sustainability impact” (Fisher et. al, 2008, p. 8). Instead of striving for perfection, perhaps we need to find ways to collectively embrace the “jolie-laide,” or beautiful ugly - a concept whose transformative potential has been explored by author Daphne Merkel: “These days we tend to invoke the word ‘transgressive’ whenever we want to move a given discourse outside the box, but jolie laide comes out of a different attitude than mere defiance. In its endorsement of the poetics of irregularity, jolie laide hints at alternate possibilities rather than an antithetical universe” (Merkin, 2005). The late Alexander McQueen’s work is one (albeit avant garde) example of fashion that challenged the notion of beauty and often blurred the lines between the exquisite and the grotesque. This type of artistic commentary is clearly difficult to translate into the mainstream, but it is not impossible to imagine concepts of beauty being challenged in support of a greater good. The world of fashion commerce currently regards high-speed as a permanent condition, and deftly capitalizes on what Colin Campbell, Emeritus Professor in the Department of Sociology at the University of York calls our “almost magical ability to produce new wants immediately after old ones are satisfied” (Jackson [Ed. ], 2006, p. 280). Indeed, human nature’s inherent inclination for the new is a perfect complement to brands’ continual production of novelty for financial gain, and as Jackson explains: “Taken together these two self-reinforcing processes are exactly what is needed to drive growth forwards” (Jackson, 2009, p. 101). Our desire for novelty is further fuelled by the extreme affordability customers have come to expect, with clothing prices in the U.S. falling for thirteen of the past seventeen years (Hilsenrath, et al., 2011). According to Professor Mathilda Tham, H&M alone handles over half a billion goods per year (Black [Ed. ], 2013, p. 216); an undeniable testament to the tremendous public appeal fast fashion has generated. Is it possible to redirect the pleasure of speed and novelty in the pursuit of a more balanced and sustainable system? Were the true costs of the garment industry understandable to the average individual in a tangible way, its lustre might fade, but at it stands, we are far from such a reality. At present, the complex and byzantine-like supply chains from which items of clothing emerge remove any chance for rational decision-making about the clothing we purchase. We are often told - especially by those in power - to “vote with our dollars,” and yet the distancing effects that accompany our global economy mean we are never provided with perfect information, and we are not insulated from the powerful influence of marketing. Today's fashion commerce provides us with seemingly endless choices of colours and styles, but if we wish to engage in - metaphorically speaking - mass-transit based fashionable pursuits instead of single-occupancy ones, our options are far more limited. To complicate matters, unlike food, where choices can impact one’s personal health, there are few personal consequences for clothing choices, be they purchasing or disposal. This lack of feedback makes rational, thoughtful decision making hard. Be it through our culture of instant gratification or in the anxiety embedded in constantly achieving quarterly results, the pace at which fashion unfolds unsurprisingly makes it difficult to see the wider implications of our actions and choices. Von Busch, et al. for example, refer to the “synchronized slavery” of trends amplified through social media, noting that: “With a continuous low of new styles and cheaply accessible just-in-time-fashion, we are stuck in the contemporary affect, and it is hard to get an overview, to take time to see the bigger picture. It is even harder to ask the tough questions and build other values other than the easily accessible ones” (von Busch, et al., 2014, p. 56). The endless newness produced by the garment industry undoubtedly provides excitement, but it can also make it difficult to develop longer-term thinking about the effects of fashion commerce. Can we create a “gap” - a space for mindfulness within this frenetic pace of trendsetting - to cultivate the overview effect and reconnect to the continuity that makes fashion such an important part of our cultural lives? Individual resistance to change may, in some cases, be more accurately described as a feeling of powerlessness to change in the face of the dominant structures (and myths) that define contemporary society; myths that have only recently begun to be questioned. As Professor Mihaly Csikzentmihaly explains, many affluent societies currently celebrate consumption as an act of patriotism, because “unless people buy more houses, more cars, more sporting equipment and clothes, the economy will falter” (Jackson [Ed. ], 2006, p.363 - 364). Instead of consumption driving production (Adam Smith’s classic economic assertion), he argues the opposite is now true – our economy’s imperative to produce now dictates the need to consume. To refrain from consumption, on the other hand, is seen as antisocial and a threat to the community, because the livelihoods of many are dependent upon the continual consumption of material goods (Jackson [Ed. ], 2006, p.363 - 364). Swimming against such a tide has unsurprisingly become a difficult feat, even for the highly motivated. How might we challenge deeply rooted societal narratives of growth, consumption and individualization that permeate the fashion system? NEXT > What's broken now?